Along with is panoramic heritage, alpine meadows, snow-capped mountains and cascading waterfalls, Jammu and Kashmir travel is also famous for fairs and festivals. Thousands of tourists visit Jammu and Kashmir, especially travel to Ladakh to experience the flavour, beauty and rituals of fairs and festivals in Jammu and Kashmir. Along with Hindu and Islamic Festivals, Jammu and Kashmir is also famous for being a cradle of different strands of Buddhism. 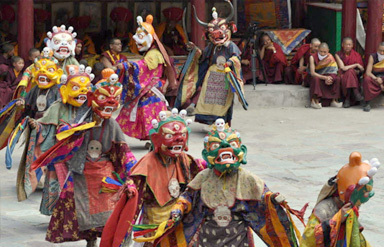 Hence, several Buddhist festivals along with their mask dances and rituals are celebrated in the monasteries in Ladakh with a lot of pomp and show. It is an important religious pilgrimage in India. It takes place during the months of July and August and takes place in Anantnag in Jammu and Kashmir. 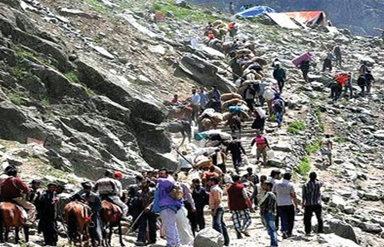 Thousands of domestic and foreign tourists participate in Amarnath Yatra every year. The Amarnath cave temple is situated 12,756 feet above sea level, making it a physically taxing journey. Also, it is 141 km away from Srinagar, the capital of Jammu and Kashmir. Pahalgam to Amarnath cave and Baltal to Amarnath Cave are the two routes for indulging into Amarnath Yatra. 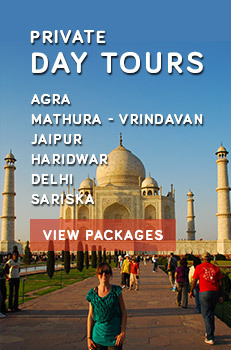 These days, tour packages for Amarnath Yatra travel are also available with helicopter rides. It is a famous cultural festival celebrated in Ladakh in the month of January. The Himalayan city lights up with much revelry during this festival which is celebrated in November. It is held in Shachukul monastery, following the Ladakhi tradition of organising festivals and mask dances in monasteries. 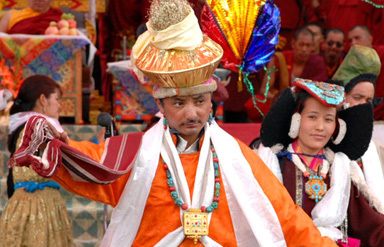 The celebration of Chemrey Angchok in Ladakh follows the Tibetan calendar. It is famous for masked dances and ritualistic performances. Just like the Indian mythology, the practise of good winning over evil is enacted through the dances of this festival. It has strong cultural importance. Celebrated with a lot of pomp and show in Jammu, it reflects the rich cultural heritage and traditional value of India. It is a religious festival of Hindus. The addition of Bahu carnival further adds to its colours and revelry. Celebrated in the Bahu Fort, it involves the idol worship to the Goddess. It is celebrated twice a year. The Bahu Fort located 5 km away from the main Jammu city is embroidered by Tawi River. Raja Bahulochan had constructed the famous Bahu Fort 3,000 years before. One of the most popular festivals of Ladakh, it is celebrated in the month of June. This two day festival is filled up with cultural performances of dance and musical recitals. Thousands of tourists come to participate in the Hemis Festival in Ladakh. It is celebrated in the Hemis monastery and dedicated to Buddhist Lord Padmasambhava. He is revered for starting the Vajrayana strand of Buddhism in Ladakh. The loud sounds of trumpets, drums and cymbals reflect the magnanimous nature of this festival, behind held in one of the largest monasteries in Ladakh. Ramadan: A pious and highly revered festival of Islam, it is celebrated with great merriment and revelry in Jammu and Kashmir. Normally, it is celebrated in the months of June and July. The mosques in Jammu and Kashmir are bustling with Muslims celebrating, praying, kneeling down on their heads and embracing each other. Along with forgiveness, the festival of Ramadan in Jammu and Kashmir also speaks about love and brotherhood. Several rituals and religious procedures are followed during Ramadan, reflecting the core principles of Islam. Delve deeper into the rich history, culture and traditions of India’s pride with fairs and festivals in Jammu and Kashmir. Every experience will be a different one.